Since this is one of those recipes that my mother gave to me, probably about thirty-five years ago, you can imagine my disgust when a famous cowboy-cookbook-authoress put it in one of her cookbooks and claimed it as her own. I don’t even think she was born when this started making the rounds. In an article in Texas Monthly, Courteney Bond writes that “Texans clearly have a proprietary interest in the enormous rectangle of thin, flat chocolate cake slathered in deliciously sugary, pecan-studded chocolate icing. But what exactly makes it a “Texas” sheet cake? Some say it’s simply because the cake is huge. Others maintain it’s because it’s flamboyantly rich. Still others point to the addition of Texas-y ingredients like buttermilk and pecans, or to the fact that the recipe is similar to one submitted to the Dallas Morning News in 1957 that subsequently swept the country.” You can trace the timeline of this treat here, or have a look at the full range of the Food Timeline, tracing more treats. The proportions may vary slightly. Some use walnuts instead of pecans (it doesn’t really matter to my way of thinking), but all recipes include buttermilk and cocoa. Yield: 1 half-sheet-cake pan (about 15″ by 10″), in less time than it takes to drive to the big box store and pick up a cake. 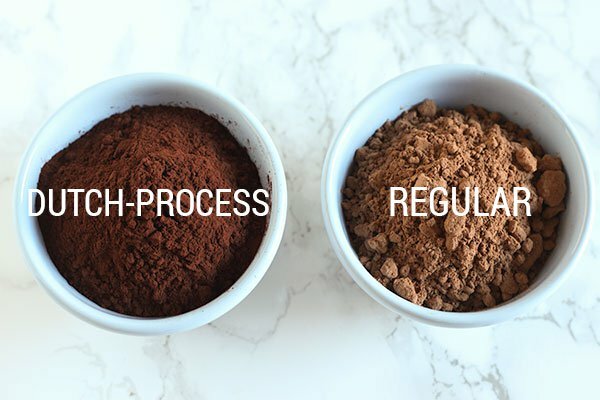 Here you can see the difference between the Dutch-process cocoa and regular cocoa powder. I think the taste difference is dramatic (think more chocolatey and rich). Pour boiling liquids over dry ingredients and stir. 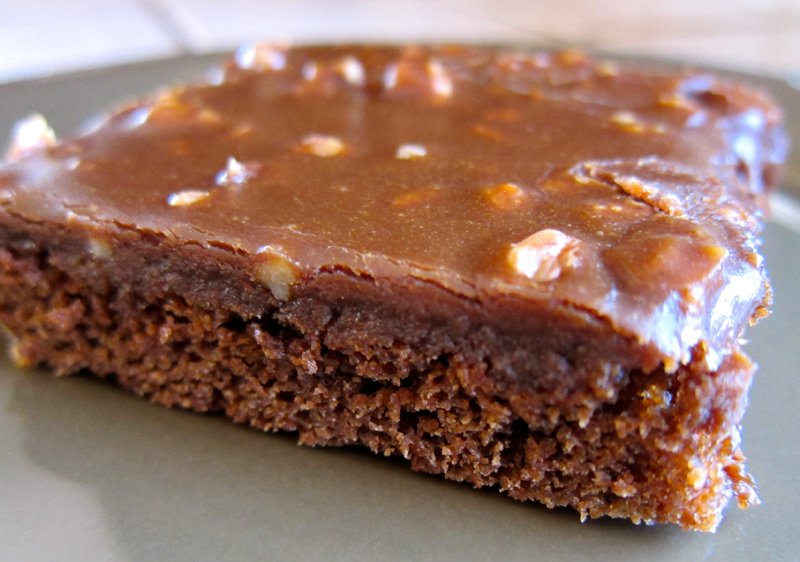 Combine and pour on slightly-cooled cake, spreading to cover evenly. Posted in Cakes, Dessert, Quick! Yummmm!!!!! One of my favorites!